News logging - Licenses for foreigners. Okay, good news! We have the new gedoogbrief. All performers without a license who are using voice amplification are advised to carry a copy of this gedoogbrief, which can be downloaded from the perform page. Note that the previous gedoogbrief covers only the season of 2009 - so get the new one! Apparently, there is a new gedoogbrief allowing voice amplification, not only for this season, but for "undefined time". This letter has already been signed by the Mayor and is ready for redistribution. We will get it as soon as possible. After two years of try-outs and evaluations, we are trying to get this year's gedoogbrief> not only for this season, but for an unlimited amount of time. Apparently, 'everybody' of the Amsterdam-Center partial city council seems to be *against* prolonging last year's allowance of voice amplification, but nobody knows why and what are the reasons. Hm, this smells like a problem. We just received the new gedoogbrief. All performers without a license explicitely allowing amplification are advised to carry a copy of this gedoogbrief, which can be downloaded from the perform page. Good news! The voice amplification allowance will be extended. The gedoogbrief seems to be ready and we try to have it available asap. We were told that currently there is enough information gathered to make an evalulation about last season's use of non-licensed voice amplification. However, the meeting in which an official decision will be made, has been postponed a few times. The official evaluation by the City Council has not been done yet. They are currently gathering information and still waiting for reactions from the police etc..
We will do our best to let this not turn into an utter 'silence', where the evaluation will never happen and thus the 'gedoogbrief' will not be renewed. The season has come to an end and the Mayor's 'gedoogbrief' (letter of allowance) has done it's job. A few times the police came to check and appeared to be not completely informed about the situation concerning voice amplification. Generally, showing the 'gedoogbrief', sometimes with a little additional explanation, worked well; no unpleasant situations occured. One time a copy of the 'gedoogbrief' was given to the police, to 'spread the news'. Now we need to wait for the official evaluation by the City Council. From there they will decide if and how this system will be continued next season. This evaluation is due sometime coming December. Today we have received the Mayor's 'gedoogbrief' (letter of allowance) which makes it possible for non-EU performers (thus without a license) to use voice amplification during their show. Although the text is (still/again) contradictive, not really clear and not how we would have liked it, we think it is a useable document. Non-EU performers are advised to carry a copy of this gedoogbrief, which can be downloaded from the perform page. A new correct license has been issued. The text is completely the same like last year, nothing has changed. The problem with the EU-licenses seems to be solved. Thats means, the new recent problem concerning amplification (see Feb 15, 2008). Deliver the license plus a new passport photograph to the counter of the license department, and ask them to swap it for a correct license. Today we have received a reaction from the license department about our concept text for the 'gedoogbrief' and the license. Their reaction sounded incensed, irritated, suspicious, and yes, slightly arrogant. They are wondering why we made the remarks we made. Well, remember a month ago, when nobody at the license department seemed to know about the amplification policy and the streetperformers had to do the license department's job? They want to stick to their own text, to avoid confusement. Well, was their own text not the reason why they got confused? Maybe they are irritated because of all the extra work, but isn't that a result of their own non-professionalism, and not because of us, in fact despite of us? Or maybe they are annoyed because actually we know better than they do? Please don't blame us for being professional, maybe instead take it as an example: know what you are talking about, before you speak? We will think what would be best next. The 'gedoogbrief' is far from optimal, but possibly useable. Further, it is March now, season has started and some are already performing. Just some funny news in between... The print on the follow-up number for the counter of the license department has been changed. Apparently, we have evolved from "hinder in de open lucht" (open air nuisance) to "Straatartiesten" (street artists). From nuisance to art, nice upgrade, eh? The license department has acknowlegded there has been some confusement on their side concerning voice- and music amplification. They will now work on a new 'gedoogbrief'. A few new licenses including amplification have been issued. Apparently, SOME of what we wrote concerning amplification came across to the license department, however, there are some errors in it. One part is stating permission to use amplification for voice and music, another part forbids all use of amplification. The limitation of sound level and maximum time has completely disappeared. All and all contradicting and messy. We will try to find out if this is just (again) some kind of mistake, or if things are getting worse and worse. We have dug into our archive and have sent all sense making data concerning amplification to the license department. We will wait for their response. Today we have read the reaction from the license department about the '7-minute' mistake in the 'gedoogbrief'. It's a total surprise; they are saying it is not a mistake, but it's the policy that exists already for many years. Also, inbetween the lines they accuse us of lieing, or at least trying to get the policy broadened in a sneaky way. They refer to the text of the license as 'proof' of their point. For around 10 years, voice amplification is allowed, all through the show. Now, since a few years, also music amplification is allowed, but limited to a maximum of 7 minutes. The text in the license has been changed accordingly, although a bit 'messy'; however in practice there was never a problem, linguistically it could be interpreted the wrong way. Apparently this messy license text is taken as fixed reference to the current policy. It's a surprise that this is their way, and seemingly nobody at the license department really knows. Are we dealing with analphabetic amateurs, or is this the government of Amsterdam? Or maybe this is just 'politics', and an attempt to frustrate us? Either way, it looks like we must dig into our archives, do the work THEY are supposed to do and tell them what is the policy. 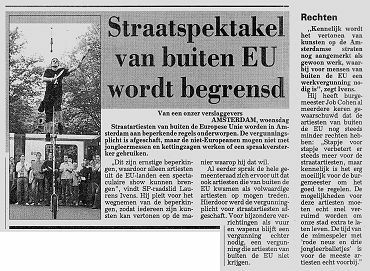 The Mayor has just signed a socalled 'gedoogbrief' (letter of allowance) concerning the use of voice amplification for street theatre performers without license (read: non-EU performers). Obviously we are very happy with that, but apparently there is some kind of mistake in this 'gedoogbrief': voice amplification will be only allowed for a maximum of 7 minutes per show. This is not parallel with the current license for EU-performers and definately not enough. We will work on getting this corrected. Further, the issues of using fire and 'dangerous props' remain unclear, or even unsolved. Also concerning these issues we will work on getting it resolved. Happy and creative new year !!! Today we had a meeting with the city council. Present were a council member of the SP, an employee of Dpt. Legal Affairs, an employee of the License department, and a performers representative. - The use of fire will be licensed, but such license can be issued to both EU and non-EU performers. - The maximum number of shows per day is not restricted in the by-law, it will also be removed from the EU license. - The time limit per show will remain 30 minutes, but excluding the time to 'set up', like in the current EU license. - Dangerous looking props, like juggling machetes, chainsaws etc, will not be restricted as long as they are not dangerous (sharp edge or point) and/or categorized as weapon in the sense of the weapon law. - Voice amplification will be allowed without license, within the limits as described in the current EU license. This will be done through a socalled 'gedoogbrief' from the Mayor. This means as much as "It is illegal, but we will let you". After one season, the council will evaluate the situation and decide for next year. - Unfortunately, music amplification will remain forbidden without a street performing license. This means that still only EU performers can obtain such permission. - An explanation of all rules, including unclear things, like what is an illegal 'weapon' and what is not, the restrictions for amplification, etc., will be explicitely written down on some document that performers can carry with them and show to the police in case of trouble. - Anyway, the new situation will be communicated with the police, so they are well-informed and trouble can be avoided. - This new situation should be effective before the coming season. Obviously, things depend a lot on the exact words, how they are described. We will try to keep close contact with the council, to avoid unnecessary unwanted effects. The SP will have a meeting 'pretty soon' with the city council to see what are the actual problems, and what are the possible solutions. Also one of us will represent the streettheatre performers. The aim will be to create possibilities and rights for non-EU performers equal to EU performers. We expect 'something' to happen within a few weeks, mainly/only about the issue of amplification. Further, the case goes to the City Council. The proposal will be discussed in the 'Commissie Algemene Zaken' (Committee General Affairs) coming September 6th. 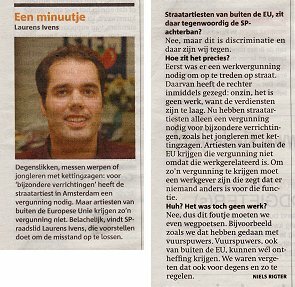 The large national newspaper Telegraaf follows with a article on the inequality for non-EU performers. The SP has submitted the proposal to the City Council and made an announcement on their web site. The newspaper 'Het Parool' reacts with a printed article and on their web site. We have decided not to bring things to court at this stage. We'll first go through the channels of the City Council. Together with the SP we are working on a proposal on how to solve the current problems for non-EU performers. It will be submitted to the Council within around one week. However, it will be dealt with probably only in the Coucil's meeting of September. Only fire can be licensed to non-EU performers. This license is currently being made and will cost the same as a normal performing license. All other special allowances can NOT be licensed to non-EU performers. This is not good... It does cover non-EU performers using only fire in their show, but no other non-EU performers. Especially amplification is an important issue and concerns nowadays practically ALL performers. We will think about the next step. Concerning special allowances, ONLY use of fire can be permitted to non-EU performers. All other allowances are exception of the streetperforming by-law. This means a normal license is still required and can not be issued to non-EU performers. This was said by a juridical employee of the Mayor. We will inform at the license department what this means practically, and what (other) possibilites remain for non-EU performers. From several sides emails have been going back and forth. There is some confusement, because the license department says a license for fire can be issued, also to non-EU performers. Further, they deny that anybody came for a fire-license... However, when we went to the license department, the kind of special allowance was not an issue, we were just 'sent away'. There seems to be a difference between and misunderstanding about the several kinds of special allowances. Apparenlty, use of fire differs legally from use of, for example, amplification. Fire is another regulation, and nationality is no issue for this. For amplification a socalled APV-license is still needed, and the old problem for non-EU performers still apply as before. We will continue finding out what is exactly the problem, and -moreover- what could be a solution. The license department has informed and confirms that non-EU performers can NOT get a license for special allowances. The letter of the Mayor is still processed by the legal department. Within two weeks they will have more information. Today we went with an Australian performer to apply for a license including special allowances. The license department immediately stated it is not possible for a non-EU performer to get a license. When we showed the letter of the Mayor, they 'couldn't do anything with it'; they need an official declaration to change their policy. The main reason is that it is not possible to proove if a performer does or does not perform 'professionally', i.e. as a business, as a means of generating income. Therefore the Vreemdelingenwet still applies and a license cannot be issued. Further, they already stated at the counter that IF a license would be isssued, it would be only for one specific place. The license department promised to inform further concerning the letter of the Mayor and come with an answer next week. New licenses for the coming season have been applied for by several EU performers and issued by the license department. So, for EU performers things are still the same and okay. We will 'wait' for a non-EU performer to apply for a test-license. The Mayor has written an official answer (Dutch). Concerning non-EU performers needing special allowances things LOOK okay, but only the use of fire has been mentioned explicitely - as example (?) Although we think the same philosopy is valid for the other allowances, this doesn't come out clear from the letter of the Mayor. A council member has asked the Mayor what is the situation for non-EU performers and the special allowances. The Mayor promised to give answers in writing, he said to do it 'soon'. Yesterday we applied for a test-license for a EU performer, inlcuding all kinds of special allowances. The application was done without any difficulties, and the license was issued today, as we wanted. So, for EU performers things are like before and no problem. Apparently, things are unchanged for EU performers: they still need a license for any special allowances (fire, amplification, etc. ), but this license can be applied for and will be issued. For non-EU performers it looks like only a license for use of fire can be issued, NOT for other allowances, like amplification etc.. However, these are 'official answers' in writing; from the license department things are still not really clear. We are considering to apply for a test-license for a EU performer, to be sure. The license department denies that any request for a license has been refused. But there has been performers at the counter, who were sent away. What's going on? The case is if licenses CAN and WILL be issued, not if they HAVE been issued. It appears to be totaly unclear what is the situation exactly for European as well as non-European performers. Maybe a misunderstanding or lack of communication, maybe something else... The license departent waits for instuctions, but doesn't issue any licenses for the time being. A council member of the SP has asked official questions to the Mayor, concerning the situation around the special allowances and the unwanted (?) side-effects. Hopefully these will be answered during the next council's meeting. The license department confirmes that for special allowances a license is needed. They also state that such a license will NOT be granted to non-EU performers. It is not clear what is the situation for EU performers, if licenses for special allowances can be issued. However, for now the license department does NOT issue any licenses. The license department stops issueing licenses. That's strange and/or not so nice ... What is going on with the special allowances? The by-law (APV) has changed. Performing street theatre is now officially license free. Still it is unclear what is the situation with the special allowances, like amplification, fire, etc. Informally, the Mayor states that for the special allowances still a license will be required. However, since this is not directly regarding 'work', also non-EU performers will be granted such a license. Anyway, meanwhile things are really slow, nothing has really changed. Unfortunately, the Mayor's promise to get things done "before coming season" has not become reality. Coming July 6 our issue will be discussed during the Council meeting. Changing the by-law (APV) seems to be fairly easy, but our current special allowances (fire, amplification etc.) are more difficult. We have spoken to a Council member of the SP, a political party present in the Council with six seats. They will fight for a good result. Bad news... The political party AA/dG has lost their seat in the City Council after the elections of yesterday. Something we didn't think of... Through AA/dG we had a voice inside the Council. Still, the proposal has been accepted and the decision made, but it still needs to be activated, actually done. It could easily be 'forgotten', or mistakes could be made. Now that all the circus and excitement around the elections has passed, maybe a council's focussing on our case will be possible again. We will see what to do next. Great news: the Amsterdam-City council has just approved the proposal! This means street theatre performers, of whatever nationality or status, will not need a license anymore - they can perform! Agreed is that things will be effective before coming season. Practical details, like the allowance for the use of fire, amplification, 'dangerous' props, etc., which are regulated by the license, are still important, though. While having an approximate majority on our side, the Mayor wanted to come with an own proposal and wait with dealing with the issue. The council meeting postponed dealing with the license issue untill next meeting, December 2nd. The appeal committee basically copied the decision of the Amsterdam Court. Including the statement that a license would be issued as long as the performing is not your job. Bad news: the Amsterdam Court has not approved our appeal. There is some good news though: licenses can be issued to anyone if there is no economical (financial) interest. Apparently it comes down to having enough money on the bank, in order to be 'independant' enough. We are considering what is the next step. Yesterday the partial council of Amsterdam-Centre accepted the proposal of AA/dG! It still needs to be accepted by the council of Amsterdam-City, but it's a great step for mankind. The committee General Affairs of Amsterdam-City will look into the proposal coming November 10th. AA/dG will bring their proposal to the Amsterdam-Centre's council meeting on coming Thursday October 13. Here it will be voted for. Regardless of the voting result, it will also go the Amsterdam-City committee of General Affairs. After all, changing the Amsterdam by-law is a matter concerning the entire city of Amsterdam, not only the centre, and can be done only by the council of Amsterdam-City. This committee deals with the issue on coming November 10. The meeting of the committee General Affairs of Amsterdam-Centre hasn't brought any solution. AA/dG will bring their proposal to the Amsterdam-Centre's council meeting where it will be voted for. The court case went pretty well. The representative of the city council was not well-prepared and the judge cornered her a few times. The public seats were pretty full. We will wait for the court's decision, which is due in approx. two weeks. A press release (Dutch) concerning the court case and the discussion within the council's committee General Affairs (Algemene Zaken) has been sent out. On coming October 4th an internal committee of the city council will look into the proposal of Amsterdam Anders / de Groenen. The same day, at 9:00 AM, the Amsterdam court at the Parnassusweg in Amsterdam will look into the legality of refusing a license to the Canadian clown, and if necessary provide a temporary arrangement. The case is public. We have requested court for a case (a socalled 'voorlopige voorziening'). We have asked the appeal committee to skip the administrational step. We have submitted the appeal letter concerning the license refusal for the Canadian clown. We have received the decision from the city council about the license for the Canadian clown. As no surprise, the license has been refused on the same grounds as before. This is, shortly said: Streetperforming is considered a business / profession. Due to a national law the city council is not permitted to issue any license to any non-European without a residency or work permit. We will submit the appeal letter. Today the Canadian clown applied for a license again. Beginning of May we have received the decision of the appeal committee. The appeal has been declared 'niet-ontvankelijk', meaning the committee will not even look into the case. The reason for this is 'geen belang', which means 'no interest' (for the applicant). Shortly said, the committee's motivation is that the license -if granted- would be valid only untill the end of 2004 and thus expired by now, 2005. So there is no point anymore to even look into the case. A surprising result, because the committee's hearing was on December 23rd, one week before the end of the year. This aspect was not mentioned by the committee, nor the city council's representative. Weird too, because the license department needed some mistakes and quite some time to find the right article and procedure (see September 15 and later). The appeal-committee needed months to get together and another few months to make up their mind. So okay, we will again apply for a license, and follow a different procedure this time. Like Winston Churchill said: "We will never never surrender". - New situation will be applicable as of approximately half february. - New situation will be evaluated in november 2005. As of half february, application forms and actual text of the license will be changed. So, unless you really want to work now (hm - look at the weather...) the handiest thing is to wait with applying for a license untill after that. For those few who already applied and/or already have a license for this season, the license will be replaced by a 'new' one, without charge. The city council will take the initiative. Happy new year ! / ? Today the appeal hearing took place. The defense of the city council sounded pretty weak (to us ...). However, it's hard to imagine the committee will grant our appeal - it would cause a political riot. And even when the committee would grant our appeal, there's still a chance the Mayor will not follow the committee's advice (after all, it's only an advice ...). Realistically, we are counting on a negative result, which will give us the possibility to appeal again - and go to court and let court decide. The answer to our appeal is due in 'a few months'. In reaction to our request for a follow-up meeting, we received an invitation for February 2, 2005. Yes, this is three months after our first meeting of November 8, instead of just one month, as we agreed ... Not very sweet. Let's hope things will speed up from there. Although agreed during our earlier meeting with the city council there is still no appointment for a follow-up meeting. We have contacted the city council asking for such an appointment. The political party Amsterdam Anders / de Groenen has submitted a proposal to solve the problem of licenses for non-European artists. Basically, their proposal is to get the need for a license out of the Amsterdam by-law (APV). After all, if no license is needed, the city council doesn't need to refuse it. It is not clear when this proposal will be looked into. This probably takes -at least- a few months. In reaction to our appeal letter, we received the invitation for a hearing with the appeal committee. This hearing will take place on Thursday, December 23, 2004 at 13:45 in room number 0232 at the Town Hall (entrance Zwanenburgwal). The hearing is public, no public speaking rights however. The Canadian clown can not be present, he is in Australia right now, but a lawyer will represent him. Also at least one representative of the SAS will be present. A 'second' appeal letter concerning the license refusal have been sent to the Appeal Committee. We are waiting for an invitation for a hearing. We had the meeting with the city council and talked for about 2 hours. The overall feeling was positive, we think on both sides. We will have a follow-up meeting around beginning of December. After our reminder a few days ago, the city council has contacted us for a new appointment. This will be on Monday, November 8, 2004. We just received a cancellation for the meeting with the council, due to illness of the chairman of the board. There is not so much point in talking (again) to only the people who are not really in charge. A fair and valid reason, it is just unfortunate we probably have to wait another month or so, before things are actually only being looked into. Again. Today we received the corrected refusal regarding the license application for the Canadian clown. This time the city council is referring to the right article of the Amsterdam by-law. We will slightly rewrite and send our appeal letter. Last Friday, the city council contacted us to invite us for a meeting. We confirmed it today. The meeting will happen on Monday, October 4, 2004. Two of us will go there. The appeal hearing for tomorrow has been cancelled. The license department made a technical mistake by referring to the wrong article of the Amsterdam bylaw (art. 2.17 'street sellers' instead of 2.16 'street performers'). Therefore a hearing is pointless and eventually the appeal will just be granted. However, this will happen only on that ground, thus not quite serving the principal case. This situation confirms once again that the city council doesn't (want to) know the difference between street *sellers* and street theatre *performers*. We received an invitation for the appeal hearing concerning the license refusal. This will take place on Thursday, September 16, 2004 at 15:30 in room number 0232 at the Town Hall. The hearing is public, no public speaking rights however. The file is streaming .WMV format (Windows Media Player), allowing the video to start playing almost instantly. We will try to get more versions and formats available. Today a delegation of seven performers have presented our petition to the Council. We gave her a colourful bouquet of balloon-sculptured flowers as well. In reaction the Council gave reasons for the limitations and refusing a license to non-European performers. Unfortunately, those reasons seem to refer to street sellers, not street theatre performers. Further they referred to national law, which forbids the council to issue licenses to non-Europeans. However, in the specific case of street performing, this is still questionable. Besides, if the motivation exists, legal ways around are possible. We will have a meeting in the near future. Yesterday has been an intense (and hot! ), but fantastic day. More than 25 performers were present to join the protest and showed an example of on-the-spot teamwork. We held a large positive crowd, non-stop from 2:00 untill 9:00 PM. 1000 was a goal, 2000 a dream, 2187 people signed the petition! Another press release (Dutch) has been sent out, emphasizing the actual protest event. Later on we got an appointment set with the chairman of the Amsterdam-Centre City Council to present our petition on the following Monday at 11:00 AM. A press release (Dutch) regarding the situation and our planned protest event has been sent out. The appeal letter has been sent to the city council. We are working on the appeal regarding the license refusal. Part of this will be a protest event on coming September 5th in the centre of Amsterdam. Today we received the answer from the city council regarding the license application for the Canadian clown. As expected, the license has been denied. Basically it's one and a half page of legal stuff. But a quick study learns there are possibly some handles to deal with. We will do some more research and get some advice. Today we called the city council. The guy was back from holiday and the lady knew the details. But she said she is not going to do anything with it. We should wait till September, the end of the season, because only then conclusions can really be made. Besides, the whole city council is on a holiday. Hey, couldn't she have said so already in April? A bit lame, no? And what guarantee do we have that in September there is not another (good) reason for delay? Hmm ... I guess thats the end of this method. So we will focus on the application by the Canadian clown. I can not imagine they will issue the license, or grant an administrational appeal. So, eventually it will go to court. That whole stuff will take 100 years (give or take a few), but at least then it's taken care of. We are still waiting for an official answer to the application. So far nothing, they haven't even sent the invoice yet. Too bad that meanwhile the pitches are dying, performers can not work, and Amsterdam has to do without many great shows. After talking between ourselves, we came to the conclusion things are getting too much now. We are talking to the city council now for almost two years about all kinds of issues. This 'foreigner case' is going now for more than half a year, without anything actually happening. Of course we want to be patient, but where is the end? We could be patient till eternity. So we decided to create some pressure. This morning a Canadian streetperformer applied for a street performing permit. In contrast to what we were told informally before, they didn't even want to accept the application. At the counter half the department was subsequently referring to The Hague, Schengen, Foreign Police, Heaven and Hell, in an attempt to intimidate us and get us out of the office. They really didn't want to accept the application, nor give a written confirmation of that refusal. Not very nice, and not very legal. But the first step is made. Now we will wait for their decision. And for the colleague coming back from holiday. As agreed, we contacted the city council. It took a few days to reach the right person, but eventually we talked to her. We were going to look into numbers and data concerning the licenses being issued up to now, and see what could possibly be done. However, she was not able to get the data from the computer and she asked us to wait for the person who can. Unfortunately, he appeared to be on a holiday - he comes back in two weeks. This afternoon we had a meeting with the city council and also discussed the new situation for non-EU foreigners. They were kind, and seemed reasonable and willing to listen. Although not confirmed in writing, it was clearly stated that, already now, all EU-members would be granted a license (of course, up to the maximum number), regardless a residency permit. As of coming May 1st (a few days from now), the same applies immediately to the 'new' EU countries. In other words: all EU citizens do not need a residency permit in order to get a license. They seem to understand that international input for street theatre is quite valuable, at practically no cost. So they promised to keep an eye on the situation and the actual effect of the new rules. Around July they will evaluate "with an open mind", and then possibly pass an advice to change the rules onto the responsable politicians.